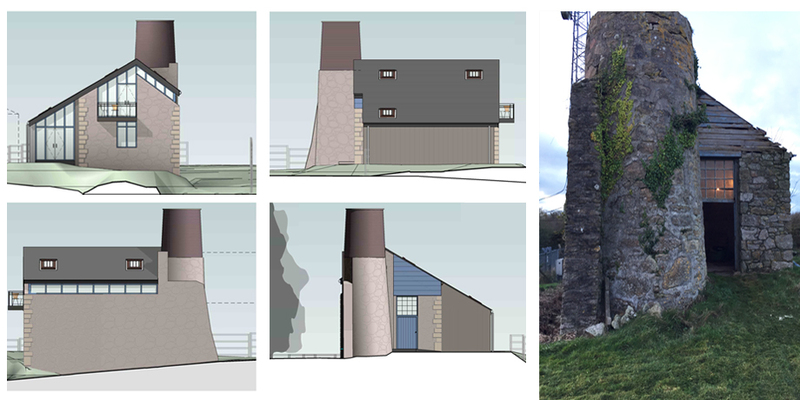 Atelier 3 Ltd was appointed in 2015 to design a scheme to convert a small disused Engine House into a dwelling. They wished to create a two bedroom dwelling which would respect the existing building whilst taking advantage of the countryside views for themselves and their extended family to use as a holiday home. The building, built in the 19th Century once formed part of the workings of Toldish Mine but has now been disused for many years and is in a considerable state of disrepair. The concept for this scheme was to retain the form and existing fabric as much as possible and make smaller interventions along with sensitively enlarging the building in an appropriate manner. The existing North West wall appears to have been substantially repaired and possibly reconstructed judging by the inner blockwork wall. Therefore we have taken the view that removing some of this would be more acceptable and therefore the majority of glazing has been introduced in this elevation. Proposals include replacing the roof, which is currently of poor quality. In doing so, it will be slightly raised, whilst maintaining the existing pitch so we can provide an additional section of glazing along the eaves allowing more light into the building and necessary repairs to the stonework made. The single storey lean to extension is created by extending the line of the existing roof. It is intended to be viewed as a modest extension, clad in timber boarding when viewed from the front of the building whilst opening up at the back which is more private and also allows for some views to the woodland beyond. The new part of the building would partly sit on top of an existing concrete slab where we believe there may have previously been a structure. Our clients decided to rescue this tiny engine house to save it by converting it into a 2 bedroom dwelling.